Tommy Thompson Touts Giuliani In S.C. When Mayor Rudy Giuliani (R-N.Y.) stopped in Charleston, S.C., Friday, Oct. 12, he brought an announcement, and a supporter, along to his afternoon appearance at the Double Tree Inn at 181 Church St.
Former Wisconsin Gov. Tommy Thompson, who dropped out of the presidential race earlier this year, announced his endorsement of Giuliani. He was promptly answered by the chant, "Rudy, Rudy" from the standing crowd. "I want a candidate that's going to be able to stand up and be able to win the Republican primary and take on Hillary Clinton and win," Thompson said. "Who do I want to appoint federal judges?" Thompson's answer, of course, was Giuliani, however some members of the press questioned Giuliani's ability to select dependable staff members. Giuliani's former commissioner is currently in a battle against a criminal indictment for tax fraud and other crimes, including bribery. "I made a mistake," Giuliani said. "I should have checked his background more carefully." However, Giuliani said this "mistake" was not a reflection of his entire political career. "I must have been looking mostly carefully," Giuliani said, regarding what he said were his accomplishments as governor of New York. The accomplishments included reducing crime and handling the situation after 9/11. But Giuliani did not just talk about his achievements. He and Thompson repeatedly offered the crowd the ultimatum "Rudy Giuliani or Hillary Clinton?" In fact, the two seem to expect Clinton to win the Democratic nomination and did not mention any other Democratic candidates. Thompson even said this expectation was a reason for his endorsement. Thompson, however, is known to disagree with moderate Republican Giuliani on certain issues. Abortion, a hot topic nationally, was also a hot question directed toward Thompson at the speech. Thompson paused before explaining the effect of this on his decision to endorse Giuliani. "I feel very content with my selection," Thompson said. "You're never going to find a candidate that agrees with you 100 percent." Giuliani is content with Thompson's selection as well. "His endorsement means a great deal politically," he said. Thompson and Giuliani added that it is important for them to pay attention to South Carolina. "South Carolina is key if you want Rudy Giuliani to be president," Thompson said. Giuliani said he wished the rumors of Gov. Mark Sanford's (R-S.C.) support of his campaign were true. "I think everybody wants Gov. Sanford's support, but he hasn't decided," Giuliani said. Giuliani also highlighted his platform. "This isn't a campaign to come in second or third," he said. "It's a campaign to win." Giuliani's "campaign to win", he said, includes welfare reform and maintaining a strong military. 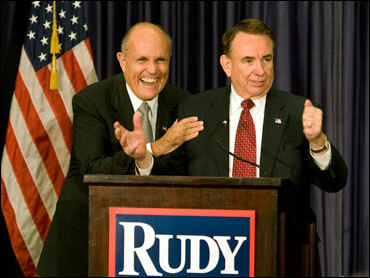 Although Giuliani did not remark on the specifics of his platform regarding the war in Iraq, according to the Web site www.joinrudy2008.com, he does not favor setting timetables to pull out of Iraq, because he believes the opposition will use a timetable to their own advantage. Giuliani disagrees with most Republican politicians, such as Thompson, regarding abortion rights. Giuliani does not support partial birth abortions unless the mother's life is at stake, according to the Web site, but he does not plan to ban abortion all together. Instead, the Web site states that Giuliani encourages adoption in hopes of deterring women from having an abortion. Giuliani is a Roman Catholic. Under Catholic doctrine, abortion is forbidden under any circumstances. Another prominent topic in national debate today is the definition of and the rights tat accompany marriage. According to the Web site, Giuliani believes that the definition of marriage is only that between a man and a woman. However, he supports domestic partnerships, because he "believes in equal rights under law for all Americans." Although Giuliani ranks high in the polls for now, there is room for the numbers to shift closer to the primaries.